Insurance software so flexible that you’ll reach your business goals in no time. 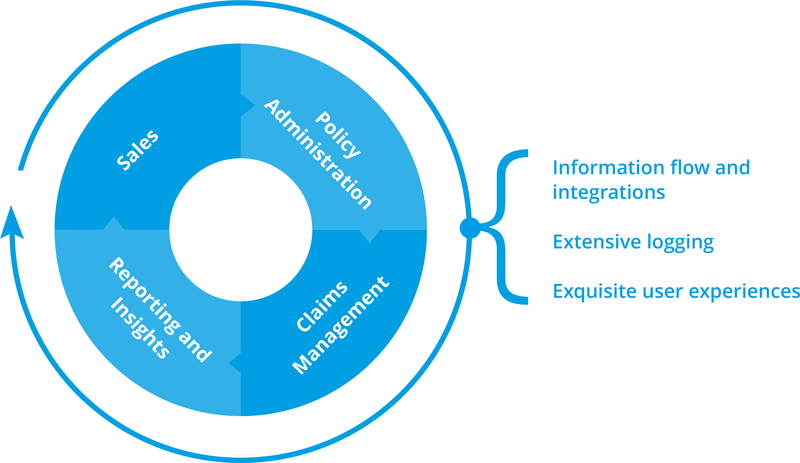 Cloud Insurance is a web-based core insurance system with extensive policy and claims management capabilities. Say goodbye to long implementation projects. And when in operation, enjoy the flexibility of easily launching new products in the market. Include distribution partners, (re)insurers and other stakeholders in your digital strategy. White-labeling, co-branding, pricing overrides? We got you covered. Reduce cost and improve efficiency of administrative operations by automating your manual processes and enabling customer self-service. Sleep safe at night and check those compliance checkboxes. We manage a strong security architecture, stellar data quality and out-of-the-box reporting tools. Want to use IoT sensor data in premium calculations, make premiums fluctuate over time, offer monthly subscriptions? You may not necessarily use all our exciting features from the get-go, but you should choose an insurance system that have you covered for the future. The product and pricing engine is robust and heavy-duty. Yet it is remarkably simple to configure new products and pricing. Cloud Insurance is used to serve the local insurance market in over 20 countries in five continents. We take pride in flexibility across currencies, payment methods, time zones, languages and legislative environments. Affinity, partnerships and new distribution strategies represent great opportunities in the insurance industry today. Give your partners access to their own customer database, products, pricing, reports, documents, and branding. You can even mix partner and end-customer payments. We provide awesome APIs and integration options so all your systems can communicate frictionless. Cloud Insurance includes a range of out-of-thebox solutions for online sales and My Account portals, which enable you to launch a complete offering super-fast. If you want to dive into the details and build the customer journey yourself instead, enjoy our modern API. We have clients working in our system across over 20 countries in five continents. Our client base includes insurance companies, agents, brokers and MGAs – a testimonial to Cloud Insurance flexibility. It’s all about balance and perfection. We are a team with a fresh perspective on the insurance industry, combining experienced assets and techies that love the latest and greatest. Cloud Insurance is modern and lean, but at the same battle-tested in large deployments around the world. We take pride in making a complex back-end seem super simple for the user. Want to learn more about how Cloud Insurance can supercharge your insurance business? Book a demo or leave your contact details, and we will be in touch.